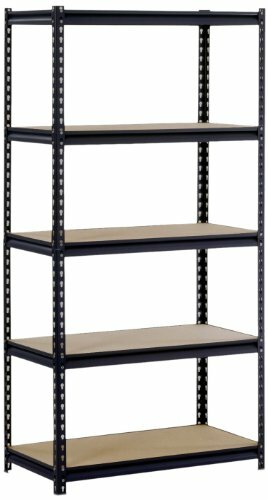 Steel heavy duty 5-shelf shelving unit. Black color. 4000lbs Capacity. Measures 36" width by 72" height by 18" depth. Standing five-shelf unit with a 16-gauge steel rack and shelves made of particle board to support an 800-lb. per shelf capacity and a 4000-lb. total capacity. Item does not come with post couplers. If you have any questions about this product by EDSAL, contact us by completing and submitting the form below. If you are looking for a specif part number, please include it with your message.